Hello I am a Reaper named Redstrike from Mount Tyrannas (NA). For those who do not know me, I am one of the main DPS in the highest ever score runs for Sky Cruiser Endeavor pre- and post-Knockout Patch on the North American servers. I believe what I know about Reapers holds a lot of credibility due to my success in those score runs as you need to be playing your class near its max potential to be successful. The purpose of this guide is to help new and experienced Reapers further optimize their rotations. These are your two option for a Visionmaker weapon. Keen Etching: Increases Crit Factor by 18. +3: Decreases skill cooldowns by 7.2%. +5: Increases damage by 6%. +7: Increases damages by 6.9% when attacking from behind. +9: Increases damage by 9.3% when attacking enraged monsters. Energetic Etching: Increases Attack Speed by 4%. Decreases skill cooldown by 2.5%. Option 1 is very nice for your daily dungeon runs and it is also good for high score runs. Option 2 is specialized more for high score runs. However, the fluidity of your rotation will suffer from an extra 5% Attack Speed in daily dungeon runs without popping Bravery Potion or Rootstock Consumables that give 4% Attack Speed (such as Lamb Bulgogi, Half-Moon Croquette, or Struthio Breast Salad) . You will also lose 18 Crit Rate by using Energetic III Etching. Although 18 Crit Rate is trivial in score runs, the difference will be much more apparent in medium to long duration fights (like the upcoming Dreadspire 2). In the new dungeons, Kalivan’s Dreadnaught, Forsaken Island, and the upcoming Dreadspire 2, bosses are not permanently enraged. What this means is that you won’t benefit from top line Enrage roll 100% of the time. You will not get penalized for burning through your main skills faster because Shadow Lash will always be off CD (Of course, you need to have good management of your skills in order to have infinite rotation). Keep in mind that this “infinite rotation” is not actually practical in real boss fights except for the last boss in Forsaken Island. In real boss fights, you will be dodging attacks which will change your rotation. This is just to show that if you are not running out of skills with no interruption, then you should not be running out of skills when you are fighting bosses that require you to constantly re-position. In many situations, Attack Speed can help you finish casting a hard hitting skill like Sundering Strike, Grimstrike, Whipsaw, or Shadow Burst before a boss turns. This is especially relevant in the Knockout Patch as certain bosses turn as a part of their skill set (e.g. 1st and 2nd boss FI and even 2nd boss KD) or throw out a lot of secondary aggro (2nd boss SCHM, Perimos). In short, Attack Speed is better for bosses that require a lot of repositioning (3rd boss SCHM, Darkan) and for bosses in the upcoming Dreadspire 2. Attack Speed Top-line is amazing for Shadow Reaping. Attack Speed Top-line should allow you to execute more Shadow Reaping rotation compared to Enraged Top-line. Is Cooldown Reduction a good Top-line roll for Reapers? With the new glyphs added in the Knockout Patch, you have essentially infinite rotation. (Note: You do need a single Bottom-line CDR roll on your weapon). If all of your main skills go on CD, Shadow Lash, glyphed for 25% CDR, should always be up and will act as a buffer for your main skills to come off CD. CDR Top-line hurts your Shadow Reaping damage, but it also affects your damage outside of Shadow Reaping because you won’t have enough attack speed to take advantage of that extra 7.2% CDR. The following gear will act more as a guideline for your rolls. If you have higher or lower tier gear, then gear rolls should look similar. If you have a non-Visionmaker gear with only 3 bottom rerollable stats, aim for the first three stats shown. Grimstrike is the best chest roll because it is the most powerful skill out of all the possible chest rolls. Most of the other options are utility skills or DPS skills that are weaker than Grimstrike. Increases damage of Grim Strike by 12%. Grounded Etching: Increases Endurance by 8. +5: Decreases damage taken from frontal attacks by 6.9%. +7: Decreases damage taken from enraged monsters by 10%. +9: Raises max HP by 8%. +6: Increases Power by 5. +9: Increases Attack Speed by 2.25%. Increases Movement Speed by 3%. Replenishes 1% of total MP every 5 seconds. Increases crit resist factor by 18. +3: Increases Movement Speed by 6%. +6: Increases Endurance by 4. +9: Replenishes 1% of total MP every 5 seconds. +10: Increase Endurance by 1. +11: Increase Endurance by 2. +12: Increase Endurance by 3. If you decide to go with Attack Speed Top-line, go for Keen etchings on both your gloves and weapon. Reapers, along with all of the other classes that do not have a high priority skill that is guaranteed to crit have to use a full crit build in order to output a good and relatively consistent DPS. If you decide to go with Enraged Top-line, I suggest going for one Energetic III, and one Keen (if you cannot afford one Energetic III, temporarily settle for a Keen II). The reason why you need an Energetic III with a Top-line Enraged is to mitigate the necessary Attack Speed you are missing to get proper back time. You don’t want to constantly be in a situation where you have to re-position mid rotation because of the lack of Attack Speed. Being constantly disrupted mid rotation is going to hurt the overall flow of your rotation. Forceful is slighty stronger than Pounding with a Priest composition. The only disadvantage you have when using Forceful is during the beginning stages of a fight. Most of the time, Cable Step → Shadow is used as an opener to gap close and you would have to crit on Cable Step for your Forceful to activate, which is unlikely. If you do not crit on Cable Step, this means you are losing DPS on Shadow Burst due to the fact that Forceful was not activated. If you are using Forceful, I would suggest opening with Pendulum → Whipsaw. A Glistening Armor Dyad is a necessity. Reapers consume mana very rapidly especially during Shadow Reaping. Even with Glistening Dyad, you still need to carry around Mana Potions. You also do not want to rely on your Shadow Lash to replenish your mana. The sole purpose of Shadow Lash is to be used as a cooldown buffer for higher priority skills. The ideal Glistening Dyad to have is Glistening Hardy Dyad. When running with a Mystic, I highly suggest switching 2 Edgetock pieces for 2 Galleon pieces due to Mystic’s Aura of the Merciless that gives a significant boost to your Crit Factor. With a Mystic and best-in-slot gear, your Crit Factor should total 296. At this high of a Crit Factor, running 2 Edgetock would probably hurt your DPS because your skill damage will be lower and it is likely that you will crit as much as a 3 Corvette + 2 Galleon set up. The following gear will act more as a guideline for your rolls. If you have higher or lower tier gear, then gear rolls should look similar. Raises max HP by 9,605. Raises max HP by 3,436. Increases Crit Factor by 16. It is necessary for any player to have two brooches: one Empowered and one Quickcarve. If you cannot afford a Superior Brooch, then obtain Simple Brooches from dungeons like Kalivan’s Dreadnaught Normal Mode or Channelworks. Quickcarve will be your main brooch because Attack Speed and Crit Rate have better synergy with Shadow Reaping. Using Quickcarve brooch during Shadow Reaping will allow you to execute more rotations and increase your chance to crit the majority of your skills during Reaping. If you can only afford one superior brooch, then pick yourself up a Superior Quickcarve Brooch. 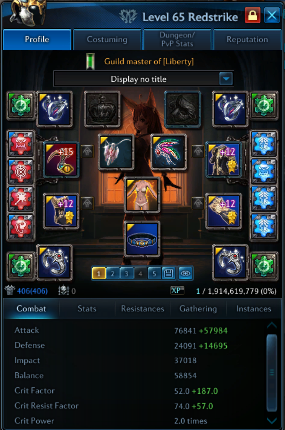 Why Blazing Double Shear glyph and not Cable Step CD glyph? Blazing Double Shear glyph will give Double Shear a 20% boost in DPS. Generally, you will be able to utilize this glyph effectively in a run. This glyph is also crucial during the Slaying Shadow Reaping Combo (Spiral → Grim → Shear → Grim → Sunder). This is not to say that you cannot swap Blazing Double Sheer for Cable Step CD. If you prefer Cable Step CD then that is your choice. But if you are doing a high score run, then Blazing Double Shear is a must. Why Shadow Lash CD glyph and not Smite CD or Retribution or even Shadow Step glyph for your last 5 points? Shadow Lash is actually not that bad of a DPS skill for a filler. If you ask me it is a REALLY good DPS skill for a filler. It does roughly 300k+ crit per hit with +15 VM5/VM6 in a party set up with only nostrums + crit scroll. Since Pendulum and Whipsaw CD have been lowered by 10%, it has become a little bit more rare to use Smite as a filler. More often than not, a higher priority skill will be up before you have a chance to use Smite as a filler. One decision that you will make often is whether to use Smite as a buffer for Pendulum → Whipsaw or go into Shadow Lash while there is roughly 2 seconds left on Pendulum → Whipsaw. Which rotation to execute out of these two are completely on your judgement. From my experience, it’s 50/50. Sometimes I use Smite as buffer for the Whipsaw combo, and sometimes I just go into Shadow Lash (Although this is kind of contradictory to the priority list which will be mentioned in the next section as Shadow Lash has a higher priority than Smite. However, sometimes the alternative is a better rotation depending on what the boss is doing). Finally, Shadow Lash has a longer buffer for CDs and does significantly more DPS than Smite, therefore glyphing Smite CD is by far a worse choice. In all of the dungeons that we have currently, it is unnecessary to glyph Retribution or Shadow Step CD for more survivability. With good skill management, you should be able to evade comfortably with non-glyph Retribution and Shadow Step (this is coming from a player who has done over hundreds and hundreds of resets on score runs with < 50% HP due to Slaying Crystal where getting hit by a single boss attack means death) . Although I cannot say for certain if Retribution CD or Shadow Step CD is necessary for the upcoming Dreadspire 2 as I do not have experience in Upper Dreadspire. Spiral → Shear → Grim → Sunder → Spiral → Pend → Whip → Shear → Grim → Cable → Shadow Burst → … etc. WRONG. If you play Reaper based off of this rotation, you are not maximizing your DPS. It depends… In fact it’s actually pretty complicated to give a concrete answer because the rotation you use depends on what the boss is going to do. I will explain why Cable Step → Shadow Burst is one of the highest priority further down this section. Why is this the priority list? Pendulum → Whipsaw has to be the highest priority because it is one of your best and fastest application of a hard hitting skill. If my Grimstrike resets and Sundering Strike is up, should I use Sundering Strike or keep spamming my Grimstrike? The priority list says to use Grimstrike until it goes into CD. If you reset so many times that you end up losing a cast of Sundering Strike, then that’s okay because the damage you would have gained by resetting Grimstrike would have been greater than a single cast of Sundering Strike. Also keep in mind the Grimstrike resets also act as a buffer. So if you reset enough times, you may be able to skip a Shadow Lash rotation which means more casts on your main skills. In addition, Sundering Strike is naturally cast after Grimstrike, so it makes more sense that Grimstrike is a higher priority than Sundering Strike. (Cable Step → Shadow Burst) has also been pushed down on the priority list, but its use is a little bit more complex. The reason why (Cable Step → Shadow Burst) is listed as one of the highest priority is because of distance. Sometimes, when you start a boss, the tank is usually the first one in. (Cable Step → Shadow Burst) allows you to gap close much faster than running up behind the boss then start attacking it. Again, it only becomes the highest priority if you are too far from the boss. The purpose of the priority list is to determine your opening move and to determine what rotation you’re going to use in case multiple skills with high priority are off cool down. is a suboptimal opening one. The wind up for one of your hardest hitting skill in this rotation is 3 skills long containing 2 low priority skills. So why don’t we just open up with Pendulum → Whipsaw?! As stated above, it is the fastest application of one of your highest hitting skill, so it makes much more sense to open up with this combo. With that said, let’s create the guideline for your rotations. You do use this rotation, but it is usually used during the middle of your rotations. Do not misunderstand. There is a difference between basing your play style off of this rotation and using this rotation based off of the priority list. When should you open up with (A)? Generally, you want to open up with (A) if you know the boss is not going to turn around in less than 5 seconds. For example, if you open up with (A) and the boss turns around, then you’re screwed because if you decide to use any other skill, you’re going to front crit. If you decide to chase the back, then you’re going to run out of skills to re-position yourself in the next few seconds. The reason why you would have to expend 2 stacks of Shadow Step is because of the initial Pendulum Strike displacement from the beginning of the combo. I did not use Shear during this example because I was afraid that by the time I got to my Sundering Strike the boss would have turned. This example shows that the opening (A) rotation does not have to be used exclusively in the beginning of a fight. If you’re mid-fight and you’re in a position where everything is off CD, then you have to continue with your rotation based off of the priority list. An (A) example with a stationary boss where you have all the back time in the world. (A) → Shear → Grim → Sunder → Cable Step → Shadow Burst -> etc. “etc.” = continue with your rotation based on the priority list. When should you open up with (B)? The boss is going to turn around due to the boss’s natural attack pattern or an impending secondary aggro. This clip shows exactly the strength of a (B) start which is the ability to re-initiate your rotation if for some reason it was disrupted. After I finished casting Spiral → Grim, I was able to chase the back and continue with the rotation by re-initiating with the last stack of Spiral. An (A) start would have actually been better here. However, it is hard to predict what opening move Perimos was going to do. I used a (B) start here just in case he would have opened up with a “Get Back” move. Again, I opened with (B) because it would have been possible where Perimos’s opening move would have given me less than 5 seconds of back time (a “Get Back” opening move). In this case I followed up (B) with Pendulum → Whipsaw because I realized that I would also have enough back time to end my rotation with a Sundering Strike back crit. Special cases in which you need to save pendulum strike to DPS while re-positioning. As you can see in this clip, I saved my Pendulum Strike while Darkan was doing his “Double Back Swing” moveset which allowed me dodge his skill and do damage. (B) → Spiral →Shear → Grim -→ Sunder → Spiral → Pend → Whip → etc. This Shadow Reaping rotation is coined as the “Slaying” rotation because Reapers are unable to use Whipsaw during runs with Slaying crystal usage. Otherwise, they would go above 50% HP. In addition, this is the “Alternative” Reaping rotation because there are times where it is better to use this rotation. If you don’t understand why this Reaping rotation is sometimes better, then please revisit section 5.b) regarding the (A) opener. You can mix your Shadow Reaping rotation during the duration of the skill. You don’t have to exclusively use the Non-Slaying rotation if you’re in a normal dungeon run. Even though a priority list exists, there will be many cases where you might have to create a rotation different from that priority list based on what the boss is doing. The most optimal way to have continued my rotation after the Fire Puddles was Cable Step → Shadow Burst because of the distance between me and the boss. Since that combo was on cool down, Pendulum → Whipsaw SHOULD have been used based on the priority list. However, executing Pendulum → Whipsaw in the position that I was in would have been difficult. If I failed the execution and misdirected my camera to where I would have missed my Whipsaw, then I would have lost a a decent amount of damage. Instead, I went for the safer and easier rotation to execute which was closing the gap with Smite, then Spiral → Shear → Grim → Sunder. Afterward, I was able to safely back crit with Pendulum → Whipsaw. In this example, I could have ended my Shadow Lash with a Double Sheer which would have been enough buffer to get my Pendulum → Whipsaw on CD. After Shadow Lash, the priority list says to use Pendulum → Whipsaw. However, you can see that Rokdos is doing his “Donut” move set. Since the outer circle was the first indicator, there would have been a chance that Pendulum → Whipsaw would have taken me to the edge of the indicator resulting in a stun. Instead, I used a Spiral → … → Sunder rotation and saved my Pendulum → Whipsaw for displacement when Rokdos’s skill hit the inner circle. What’s to be learned from this section is that there is no definitive rotation outside of the opening rotations. That is why I put “etc.” at the end of the opening rotations. Your rotations will always be based off of the priority list, and then you refine your rotation based on the boss’s movements. To choose the most optimal rotations, you will have to predict what the boss is going to do, and the only way to do that is to gain experience in dungeons. In the most mechanically intensive boss fights, a 10+ skill-long combo that a player memorizes would be invalidated due to constant re-positioning to get the the back of the boss. This holds all true for all classes, not just Reapers; memorizing rotations does nothing but create bad habits. However, knowing the priorities of your skill and understanding why priority list exists as it is will accelerate your improvement and create a greater understanding of how to DPS. Although low on the priority list, Death Spiral has an important role in your rotation. It serves two purposes: to re-initiate combos and to cancel animations. Make sure you always have a skill that can cancel Shadow Burst’s and Sundering Strike’s animation lock. Being stuck in a Shadow Burst’s or Sundering Strike’s animation lock is a DPS loss. Cancelling these two animations will also give you a more fluid rotation. Try to avoid being locked in a skill animation before you start Shadow Lash. It is a relatively high down-time on your DPS. Occasionally this will happen. Shouldn’t I use Death Spiral to Powerlink Grimstrike? As stated above, it is much more important that Death Spiral is used to serve for re-initiation for combos and to cancel animations. The only time I would suggest intentionally using Death Spiral for power links is when your Shadow Burst is on CD. The reason why I did not touch upon Powerlinks extensively (mainly Spiral and Shear Powerlinks for Grimstrike) is because Powerlinks are naturally integrated within rotations. Due to the way skills are chained, you’re always going to have a Powerlink active for Grimstrike. 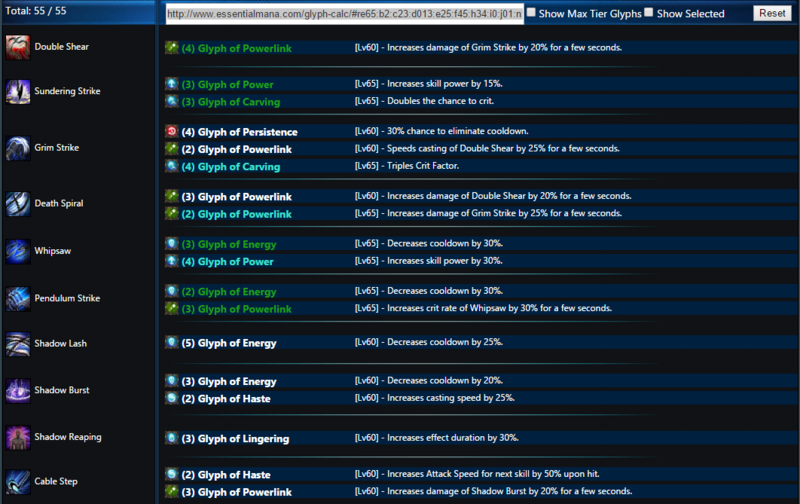 The duration of the Powerlinks are also quite lengthy. There are more important things to worry about, such as positioning and skill management, and that is what I tried to emphasize in this guide. You’re not going to out-DPS another Reaper by pulling off more double Powerlinks on Grimstrike. You’re going to out-DPS another Reaper by getting more skills off, based on how you position and how you manage your skills. If you want to see more of my gameplay, please visit my YouTube channel. Although a little bit out dated, I would also suggest checking out Kyang’s (A.K.A Greenstrike / Kiirofuji of MT) Youtube Channel or his past broadcasts on Twitch for more valuable visual aids. I learned most of what I know about Reapers from him. 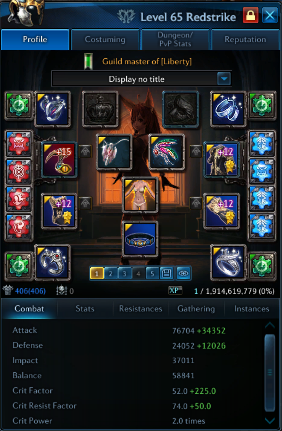 New TERA player here, which rolls should I use on the other accessories? Will you be updating the guide for rotations after the class 9 patch? Since spiral is now able to power link to sunder also should i go for Shadowvain+Shadowmaze or stick to my current Shadowmaze+Powervain. I don’t believe red will even comment or update this guide unless he does after the new changes coming and even then ninja is still going to be #1 so doubtful he will ever touch reaper ever again. First of all, Awesome guide. As a new Reaper, this guide really helps me a lot especially on the skills part. Coming from a Brawler, I am currently adjusting to the Reapers play style. Its a breath of fresh air to see people like you extending help to us who are new to this class. Lots of thanks good sir. Hello, nice guide overall. I have two questions question about reaping though. First: Why do you use Double Shear in your reaping (slaying) rotation? Both, Death Spiral’s cd and Grim Strike’s cd are so short, that they are always available to spam (Death Spiral > Grim Strike). I don’t know if Double Shear is worth spending time on because of relatively low casting speed (compared Death Spiral) and damage. You can also cancel Death Spiral extremely fast, using it just for powerlink. Second: About your standard reaping rotation (Pendulum > Whipsaw > Grim Strike > Sundering Strike). Wouldn’t it be better to just focus on spamming Death Spiral > Grim Strike > Death Spiral > Grim Strike (+ resets if you feel like it) > Sundering Strike (or even ignoring this, you can just keep going with Grim Strikes only – also dependent of boss hp). I think that Pendulum > Whipsaw takes way too much time when comparing the damage with Grim Strike, especially with the recent crit glyph. Focusing on Grim Strikes should provide much more damage in my opinion + easier positioning due to being able to be close at all times. Using Pendulum > Whipsaw is allowed for positioning purposes. This rotation might have some drawbacks with higher attack speeds. I do not personally use attack speed rolls or energetics, but I see your point in using those generally. What would you suggest for a 300 ping reaper as it’s pretty hard to cancel animations with this ping? The only point i dont agree is with chest rolls for schisma and dread gear cuz hp is very important on new dungeons since youre getting fixed amounts of damage 50/100k, having a good hp pool will increase your sustain alot more than % frontal dmg. True damage attacks are pretty easy to avoid, and you already have enough HP. (I have 115K without HP roll). Frontal dmg reduces your dmg taken by much more by 6,9%, because damage reduction rolls stack additively. If you have 50% dmg reduction, it means 6,9% becomes 13,8% dmg reduction, and even more if boss is enraged. (4 hardy niveots+6% x2+ 10% x2 = 64,2% dmg reduction, 6,9% becomes 19,3%). It’s much more useful than HP, and it helps you healer a lot . HP gives you extra 8k HP, if you die with 110K+ HP, you will likely die with 120K HP regardless. This guide is great, however it would be nice if you could show some DPS scores on a few different bosses while wearing Starfall AND Dreadnaught as it would give me a goal to achieve in my Dreadnaught gear. Great guide, I learned a lot thanks to your advices.